Flaps are Easy | Tennessee Aircraft Services, Inc.
Just because flaps are a secondary flight control doesn’t mean they can be ignored. Just a small bit out of rig and they can cost several knots of cruise speed or roll the plane enough that the wing attach cams can’t overcome it. They also suffer abuse from the power pulses off the propeller wash, especially when extended. When extended, they transfer a huge leverage to the aft wing spar via the flap rails. All this stress is bound to present itself somewhere, and some of it shows up as cracks in the flap trailing edge around the rivets. This is a well known problem, but there are varying opinions about the timing of when it becomes an airworthiness issue requiring some maintenance action. Major repair or reskinning of aircraft flight controls is a task not usually attempted by the generalist mechanic. There is good reason for this as well; most flight controls have twists and bends that generally require the control be set in a jigging fixture during the repair. Few shops in the field have proper fixtures for this type of precision work. 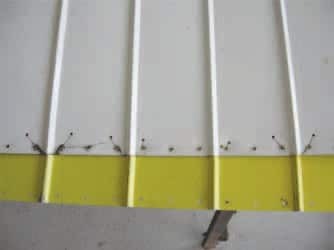 However, the typical flap on the strutted winged 100 series Cessnas is about as square and straight as a surface can get. No special fixtures are needed to keep everything in line. Our subject airplane is a restart (produced after 1996) 172 with multiple cracks in the left flap trailing edge. These were discovered during a routine annual inspection, so it’s up to the Authorized Inspector to determine if this damage requires some action to be returned to service as airworthy. As with any repair, the first stop for maintenance guidance is the applicable service manual. The 172R and 172S series Maintenance Manual makes no mention of cracks in the flap skins nor does the Structural Repair Manual that’s written for the restart 172 & 182 aircraft. Since the airframes, specifically the flaps, are the same as the legacy aircraft, we can look to their maintenance documentation for guidance. The legacy single engine Cessna never had a structural repair manual, so we’ll start looking through the applicable service manuals from most recent to older until we find useable repair reference data. The legacy maintenance manuals aren’t set up in the Air Transport Association 100 Chapter System (ATA 100), so we’ll be looking in the maintenance manual sections for the information. The 172 Series Service Manual 1977 thru 1987 “Section 18 Structural Repair” has no discussion of the flap skin cracks. The next three older maintenance manuals do have specific guidance on the flap skin damage and repair, and they all say the same thing. The 172 Skyhawk Series Maintenance Manual 1969 through 1976 has information in “Section 18 Structural Repair”. The 1963 through 1968 100 Series Maintenance Manual has help in “Section 19 Structural Repair”. The first reference to the flap issue in the 1953 through 1962 100 Series Maintenance Manual is in “Section 7 Flap Control System” paragraph 7-16 Repair of Flap. This then refers the reader to “Section 19 Structural Repair” in the same manual. Based on these criteria, our flap needs some sort of repair to continue safely in service. As with any repair, we need some guidance for our scheme. One could splice a new section of skin at a rib to replace the area with the cracks. That would leave a nonstandard seam right in the middle of the flap. Structurally that would be fine, but it would be very visible to anyone doing a casual walk around. A splice also requires a more involved log entry with references to the approved or accepted data used to design the repair. A skin replacement only requires a log entry stating a new skin was installed. It’s much cleaner looking, both on the plane and in the records. The best part is that a complete flap skin replacement actually takes less labor and the same parts cost to accomplish. There are several sources for the corrugated flap skins, and all have their good points and not so good points. Ordering the new skin from Cessna gives one a certain feeling that it will fit exactly as it should and the part will arrive fully coated with an epoxy primer. Sourcing from Cessna will mean you’re going to pay a bit more up front, but there will be less effort needed to get the part in proper shape for installation. 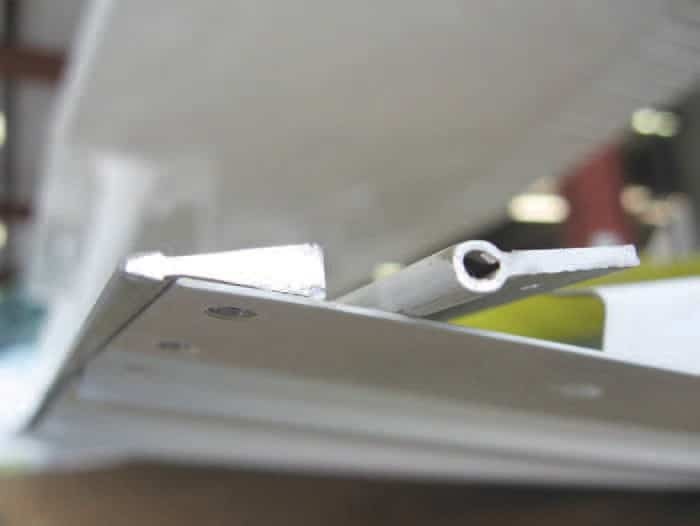 There is also the case of the trailing edge reinforcement strip. The one on our cracked flap is in perfectly good condition. However, it is largely the cause of the cracking problem in the first place. The original reinforcement is a flat aluminum strip with a round bead that helps stiffen the trailing edge of the flap. The problem is that the strip is flat, and the upper and lower skins come together at an angle. The flat strip forces the skins to bend flat at every rivet pinching the skins, resulting in stress risers and eventual cracks. The new trailing edge stiffener in place on the lower skin with the old style stiffener just to the right. While the old style reinforcement strip is exposed, this is a perfect time to replace it with a new extrusion that has the same wedge angle as the skins. There are several versions of this edge available, but we selected the unit from McFarlane. It is a solid aluminum wedge machined so that the skins lay into an inset, making it very easy to fit properly. At about $60.00, this is a very worthwhile upgrade. The extra rigidity is a big help when riveting to keep a nice straight line on the trailing edge. The repair starts with laying the flap down on a large flat surface where it can be secured top side up. You’ll notice the flap lies flat all the way around, and that’s the shape we want to maintain during the repair. The top skin and trailing edge reinforcement strip is drilled off using standard airframe maintenance practices. While the flap innards are exposed, it’s a good time to clean everything and prime the inside for future corrosion protection. The old skin can be laid on top of the new skin as a hole drilling pattern. We often use some flat weights to hold the parts flat on our wood top table for this operation. As the holes are drilled in the new skin, temporary fasteners called Clecos are installed to keep the parts in proper alignment. We also drill past the new skin into the wooden table top, so the Clecos actually anchor everything to a stable base. All cracked up. The old skin laying on top of the new skin after pattern drilling the rivet holes. The new skin can now be removed from the pattern and installed on the flap frame. We install Clecos through the new skin into every second hole in the flap spar. Standard solid rivets are installed in the open holes, then the Clecos are removed to rivet these holes. The flap assembly can now be slid to the edge of the table with just enough exposed to allow access for riveting the reinforcement strip. Keeping the minimum trailing edge exposed will help keep a nice straight edge while riveting. A few old aircraft batteries can be set on top of the flap to hold everything in position. Batteries offer a nice flat surface of non-scarring plastic that won’t misshape the skins. Of course, aircraft batteries should be used since using automotive units might give someone the wrong impression about one’s loyalties. Some technicians would choose to set the trailing edge rivets with a squeezer. We have found the hand squeezer is much more difficult to control for minimal waving of the trailing edge. One tech can easily set all these rivets with a pneumatic rivet gun and bucking bar and should get a very straight trailing edge. Cracked flap skins is one of those items we see frequently ignored due to a perception that the repair might be complicated or expensive. These cracks can be stop drilled, and the assembly remain in service to a point. Once the line is crossed into the realm of unairworthiness, a repair must be made. This is one case where an airframe repair by installing the complete new part is affordable, in aviation terms, and the finished product is often better than the original. According to FAR 43 Appendix A paragraph A (b)(1)(ii) & (xxii) this skin replacement is a major repair. Similarly, making any splice repair to the flap is a major repair per paragraphs (xxiii) & (xxiv). From a records history perspective, it makes good sense that if you’re going to have permanent repair documents recorded with the FAA, they might as well show you made useful improvements in the process.